Bret Hart was attacked during the WWE Hall Of Fame. This was not a publicity stunt and was the result of terrible security and a deranged fan named Zach Madsen. It also shows that WWE doesn’t pay much attention to pretty obvious clues on social media. Dash Wilder did pop this guy right in the face when they led him out of the ring. The attacker was arrested, but we have not seen a mugshot from this arrest. 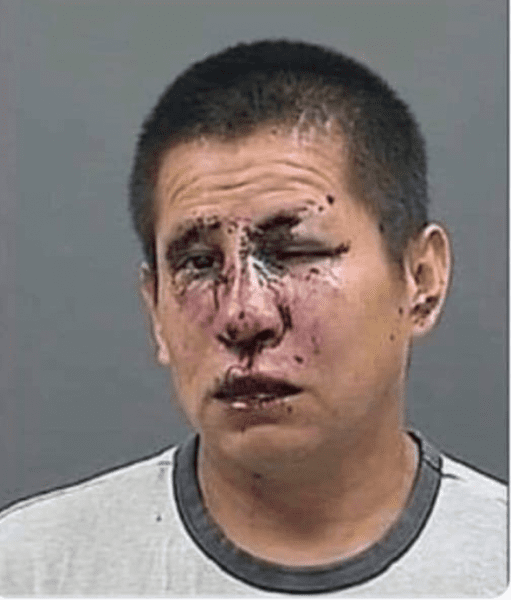 There is a picture floating around of a guy’s mugshot who happens to have a demolished face. While it’s no secret that Travis Browne, Davey Boy Smith Jr, and Dash Wilder could have taken this invader to the woodshed in a big way, he did not have a busted face like this when leaving the Barclays Center. Dave Meltzer also confirmed on Wrestling Observer Radio that the mugshot floating around claiming to be Bret Hart’s attacker is not real. The guy was arrested in January for stalking, but that is the only mugshot we’ve seen so far. This is not from last night though as that has yet to surface. If you want to see his actual mugshot you can CLICK HERE.